Calling them out for “hypocrisy,” Hinder spotlights leaders for their views and actions. Presidential big hitters such as Ben Carson, Carly Fiorina, and Scott Walker each have their bios—but so do some lesser-known state and local politicians. 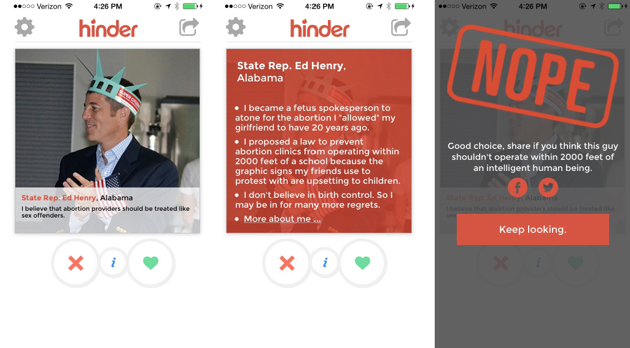 This weekend, you may want to ignore that guy or gal who messages three times in a row on a social app and instead, download Hinder, the app that aims to educate voters about politicians who have expressed antiwoman and anti-reproductive rights sentiments. Hinder is structured just like the popular dating app Tinder, except that each profile swipe reveals a different politician and a real thing that they did or said. One of the coolest parts of the app, according to Winstead, is that you can break it down by state. Since its launch last month, at least 2,000 people have download the app. Hinder launched with nearly 100 bios, and Winstead and her team are in the process of editing hundreds more to be added soon. Alabama State Rep. Ed Henry is one of hundreds of profiles on Hinder. Users can tap for more info on the person, and when they swipe either way, a humorous message prompts them to share on social media or donate to Lady Parts Justice. Their goal is for this kind of information to reach young female voters ahead of an election year where abortion access and Planned Parenthood are already big topics of debate. And Winstead hopes, too, that the app can be a gateway of sorts, for women to get further involved in the fight for reproductive rights by other means. Another particular brand of humor in the app involves pointing out people like Olivia Gans Turner, the D.C.-based director of Americans Victims of Abortion who had an abortion herself before she created the organization.